Although fall marks the end of summer frolicking, it still holds a special place in so many hearts and for good reason. For FWAConistas mix-matching, layering and the outpouring of new and not-so-new trends with a twist are Autumn faves. Check out FWAC: Trend for all things HOT from our new contributor StyleStar! Yes, warm apple cider and pumpkin pie are also nice little treats! But nothing warms the soul like fall threads for a cause. If pink is your favorite color as it is the favorite of one of our writer's (she is obsessed) you are in luck. Since October is Breast Cancer Awareness Month designers such as Ralph Lauren are offering a ton of products in the hue. If you are not a big fan of the Pepto Bismol shade do not fret! We will feature other Feel Good Shopping items for you to join the fight. And for all the straight shooters out there who just want to throw money at the problem, the Breast Cancer Research Foundation will gladly take your donations! 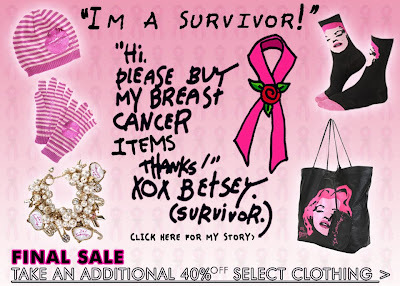 Betsey Johnson is not all about fun and games especially this October! This fille de joie is hard at work for a good cause. Her inspiring survival story lands her our Designer Watch spot this month.